BTN’s Richard Cawthorne takes to the Thames to sample the new Bateaux Windsor experience. As of earlier this month, the Bateaux London operation in the capital has a new baby sister. Bateaux Windsor follows a similar pattern – a floating restaurant taking passengers along the Thames, in this case past the many sights of Windsor and Maidenhead, for an overview of some of the best bits of our history. BTN was invited to take part in the first voyage before the operation launched to the public. Passengers can choose to have a weekday lunch on board, or Sunday lunch, afternoon tea or a dinner cruise. For special gatherings, including informal business meetings, the whole boat can be hired. 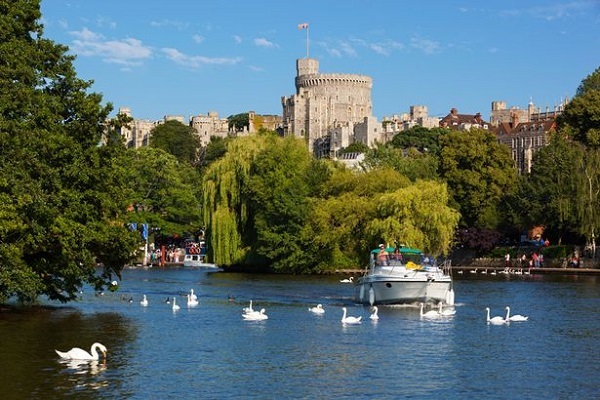 The invitation-only inaugural cruise was an evening outing with a five-course meal and coincided happily with the arrival of a brief spell of summer-like weather that showed off Windsor and its surroundings in full photogenic splendour. Bateaux Windsor’s boat is Melody, with a capacity of 44 passengers, smaller than the London versions and making for a relaxing meal tailored to the 2.5hr cruise. An elegant vessel, it has large arching windows to provide uninterrupted views of the river and countryside as you pass and a luxurious interior with much use of hardwood finishings and rich burgundy furnishings. Apart from the fact you are moving, it has all the atmosphere, as you would expect, of a smart restaurant. The food matches the surroundings, with a set menu ranging all the way from an amuse bouche to fairtrade coffee and tea, plus petit fours. Champagne, Chilean Merlot and New Zealand Sauvignon Blanc took care of the drinks requirements. For the foodies among BTN’s readership, it is worth recording the dishes, a fair indication of the Bateaux product, and all with white-glove service. The amuse bouche was roasted cauliflower soup with curry oil and poppadum, followed by a starter of smoked mackerel with wasabi, pickled turnip and dill emulsion. Main course was a slow-cooked feather blade steak with potato dauphine, spiced red cabbage, glazed roots and merlot jus, while bitter chocolate praline with blackberry gel and chocolate crumble took care of dessert. For those wanting a cheese course, Cornish brie was served with truffle honey and crisp sourdough. Dragging our attention away from the table, we were able to enjoy the sight of Windsor’s massed swans (it is a very good year for swans) and other assorted wildlife enjoying the sunshine and tracking the boat, while some of Heathrow’s finest customers, including several B747s and at least two A380s, made a fine sight as they headed into the sunset for their destinations. On land, Royal Windsor Racecourse, fences painted brilliant white, gave way to Boveney Lock and a few anxious moments while the respective widths of boat and lock gates were checked. Then it was on to Oakley Court Hotel, former home to Hammer Films and the setting for many of the company’s productions as well as starring as Frank N Furter's castle (“the Frankenstein Place”) in The Rocky Horror Picture Show. Other life on the riverbank, from grandiose boats and equally imposing houses to mobile-home parks, provided a fascinating backdrop to the journey. As Maidenhead hove into view and dusk approached, Melody turned for home and another special feature appeared – floodlights on deck to illuminate the landscape and the occasional startled swan as we passed on the way back. Docking at Windsor Thames Side was spot on time, setting the seal on an efficient, professional and highly enjoyable operation. The Melody dinner cruise costs £75 per person with sailings on Thursdays, Fridays and Saturdays in high season. Other packages include the afternoon tea cruise at £35 per adult/£20 per child on Fridays, Saturdays and bank holidays, and the lunch cruise (£35/£20), also on Fridays, Saturdays and bank holidays. Sunday lunch cruises are £45 per adult/£25 per child). Melody can be hired privately for a minimum of 30 people with a private lunch, dinner or reception, and hospitality packages are also available.